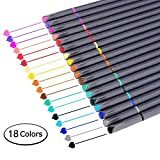 Pilot G2 Retractable Gel Ink Roller Ball Pen 12pc Ultra Fine Black is currently selling at $11.19, approximately $1.29 lower than average, giving a potential saving of $3.10 right now. With a lowest price of $11.19 and an average of $12.48 it is selling on the low end of its usual range. Price volatility is 2.38% (meaning it does not change often), so the price should stay low for a while. Right now this product is a recommended 'fantastic deal'. The current deal is also the best price on this item over the last month. 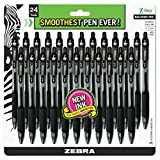 Compare the current price, savings (in dollars & percent) and Buy Ratings for the top Pens that are closely related to Pilot G2 Retractable Gel Ink Roller Ball Pen 12pc Ultra Fine Black. Here is how Pilot G2 Retractable Gel Ink Roller Ball Pen 12pc Ultra Fine Black compares with other leading Pens. Discover the smooth writing and comfortable G2, America's #1 Selling Gel Pen*. 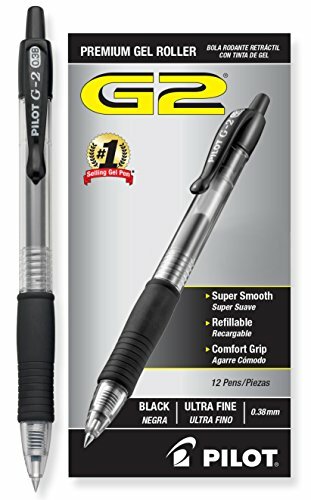 G2 gel ink writes 2X longer than the average of branded gel ink pens**. The G2 product line includes four point sizes, fifteen color options, and multiple barrel styles to suit every situation and personality. It is the only gel pen that offers this level of customization--because after all, pens aren't one size fits all. G2 is available in a variety of barrel designs, point sizes, and ink colors so you can leave a lasting impression. The original G2 features a translucent barrel and is available in four point sizes and 15 rich, vibrant ink colors for the ultimate in customization. The G2 Fashion Collection combines this top selling gel ink brand with a new fashion forward look. Fashion barrels feature a stylish floral design in a variety of colors. Black grips and clips feature black ink, while colored grips and clips feature coordinating colored ink. The G2 Breast Cancer Awareness pen allows you to show your support in the fight against breast cancer with every word you write. Each G2 Breast Cancer Awareness pen features a pink rubber grip, pink plastic clip, and a pink ribbon imprinted on the barrel. Available with either black or pink ink. For occasions that call for a more professional look, G2 gel ink is available in two refined barrel designs: G2 Pro and G2 Limited. G2 Pro combines the light and effortless feel of the original G2 barrel with a refined design perfect for professional environments. Choose from four deep-toned barrel colors with sophisticated metal accents and a comfortable black rubber grip. G2 Limited is available in six barrel colors. A durable metal barrel and a premium matte finish give a pleasant feel in your hand. Stainless steel clip and accents with coordinating rubber grips complete G2 Limited's polished and professional design. *AC Nielsen Reports on file, Pilot Corp. of America. **Independent third party ISO testing. Average of branded gel pens tested. Data on file with Pilot Pen Corporation of America. America's Go-2 Gel Ink Pen Pilot. Power To The Pen. G2G2 FashionG2 Breast Cancer AwarenessG2 ProG2 LimitedUltra Fine 0.38mm?Extra Fine 0.5mm?Fine Point 0.7mm???? ?Bold 1.0mm?Metal Barrel?Available in Dozen Boxes?? ?Retractable and Refillable???? ?Comfort Grip???? FeaturesPEN GAME ON POINT: It doesn't matter if you're at school, at work, in the office, or need to write in your Bullet Journal at home, Pilot G2 Retractable Premium Gel Pens are extra comfortable, flow smoothly and evenly in red, blue, black and other colors.PILOT G2 PENS ARE ON THE BALL: You can rely on our G2, proven to be the longest lasting gel ink pen*, with an extra comfortable grip and smooth gliding ink. The roller ball flows consistently for writing notes, a novel long hand, or for pen & ink drawing.OBSESSED WITH OFFICE SUPPLIES? : We are too! Get ready to write the most elegant to do lists, you and that legal pad! With fashion forward colors from navy and light blue, to red, black, green, purple, and more, you can color code to your hearts content.ORGANIZE AND DESIGN: With Pilot G2 Pens you can do it all. We see your creative side and think you should let it out. Your bullet points don't have to be plain black. You can dot to dot that paper with your favorite metallic, pastel and other colors.